Welcome to David and Jacob! Do you know someone who is interested in becoming Catholic? Or are you yourself interested in joining the Catholic faith? 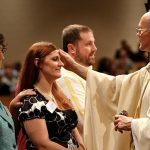 The Rite of Christian Initiation of Adults prepares adults to become Catholic. Unbaptized persons at the age of reason (aged 7 and older) who want to join the Catholic Church or explore the possibility of joining. Within the setting of the parish community and in accordance with the Church’s liturgical year, “this process of formation includes four stages as well as rituals that mark these stages.” (National Directory for Catechesis, 35) These persons are called catechumens. Baptized persons in another Christian tradition… those persons at the age of reason and older catechized (instructed) and uncatechized (not instructed) in another faith tradition other than Catholic who are seeking to become a member of the Roman Catholic Church through Confirmation and Eucharist. These persons are called candidates. Baptized but uncatechized Catholic adults who never received any instruction or formation in the Catholic faith. These adults will be prepared to celebrate the Sacraments of Reconciliation, Confirmation and Eucharist. For those wishing to convert to Catholicism or have any questions, please call the Rectory Office: 330-792-1919, or email: austjoseph@zoominternet.net. CLICK HERE to read more about the RCIA.